The first day of spring a handful of CSA shareholders and I toured my one acre field and hoop house. We tromped around in the mud. We looked at winter rye and frost-killed oats. We looked at the bed where garlic is supposed to be growing. No sign of the garlic yet. We looked at the farm equipment: red tractor, disk harrow and the sexiest transplanter on the east coast (more on that later). Skippy’s mom took some nice photos. I’ve posted some of them here. The temperature was predicted to be in the mid-twenties last night. 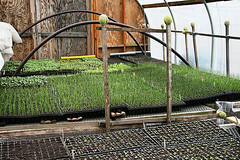 Way too cold for the seedlings in the (unheated) hoop house. Yesterday I spent a good deal of time trying to tighten things up. I added more layers of reemay (agricultural row cover) to cover the plants, secured the door a bit more and stuffed insulation in cracks. 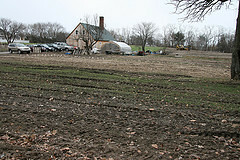 Today I hope to find a few bales of straw to put againt the sides of the hoop house. The next several nights are supposed to be cold, cold, cold. Please send warm thoughts in the direction of my hoop house!